Calling all boating enthusiasts! 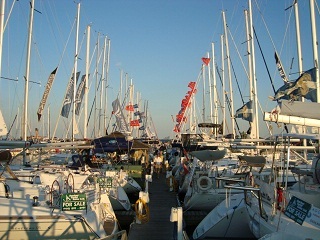 Ontario’s premiere boat show, the Port Credit In-Water Boat Show is celebrating its 22nd year come August 24-25-26, 2011 at the Port Credit Harbour Marina. The Port Credit In-Water Boat Show is the only boat show that features both new and used power and sail boats displaying vessels both on the land and in the water. Guests are encouraged to take in the picturesque sights of Port Credit, enjoy some local fare at one of the nearby restaurants or cafes, and walk the docks and explore new sailboats from great brands such as Beneteau, Jenneau, Hansa, J-Boats, Hunter, Dufour, C&C, Tartan, and Catalina. Power boat makers include Chaparral, Four Winns, Carver, Regal and Cruisers Inc. Listen to the jazz band and live entertainment. Drop in on the speakers at the Speakers Tent. Enjoy being with boats and boaters.